Filling the house with Christmas decorations is a heartwarming way to bring the holidays to your home. While store-bought ones are lovely, there’s something a little more special about Christmas decorations you make by hand. 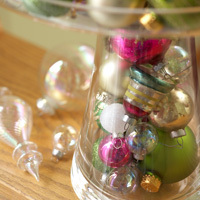 Start a new tradition this year that brings the family together for DIY Christmas decorations. Using what you already have to create new themes every year is the perfect way to blend tradition and trends and save some cash in the process. Don’t forget homemade outdoor Christmas decorations, which can be more enticing than a few lights strung over the door. 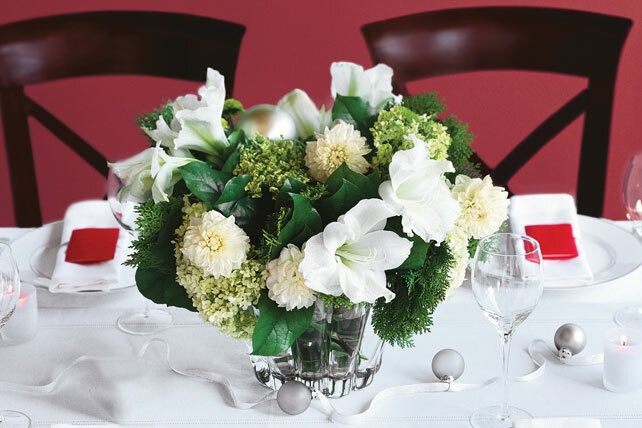 No matter what you do to decorate, your guests and families will notice. 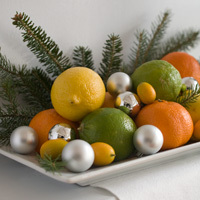 Bring elements of freshness into your holiday decor with fruit and greens. Save the fruit and you’ve got a great source of fresh juice. Always supervise and assist young children when they are working on Christmas decorations with scissors or small pieces of craft materials. Holiday cards add instant color to any spot in the house. Try this clever way to use a fork to show them off. Wrap ribbon around glasses, vases or jars. 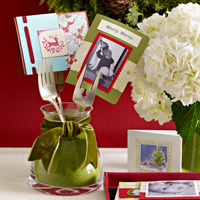 Place cards in forks and arrange in glasses, vases or jars. Chances are, after trimming your tree you still have several extra ornaments left. Why not put them in a glass container that can showcase them in a sparkly way? 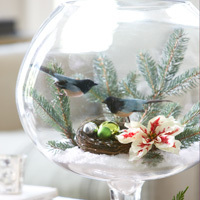 Turn a large glass bowl into an encapsulated outdoor scene with faux natural elements. Fill bottom of bowl with snow. Fill in with birds, ornaments and flowers. 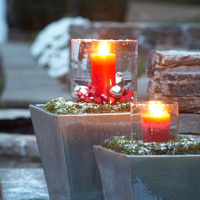 Outdoor lights are a cheery sight, but adding the flame of glowing candles makes your welcome even warmer. Place glass cylinders or jars in a safe spot away from house.